Tokyo Gate Bridge, opened to traffic in February this year, could have been better developed for tourism by allowing bicycles, some critics are alleging. Bicycles are not allowed to cross the bridge, but just before the opening to traffic on Feb. 4, a cycling event was held on the structure. Satomi Hanai, 28, of Tokyo, participated, and says she thought, "If I miss this opportunity, I may not be able to ever ride (on the bridge)." She was moved by being able to see Tokyo Bay and Mt. Fuji from the bridge. The 2.6-kilometer bridge connects the Wakasu area of Koto Ward and reclaimed land outside of a breakwater. It is two lanes each way, with a 3.5 meter wide sidewalk only enterable from the Wakasu side. The Ministry of Land, Infrastructure, Transport and Tourism's Tokyo Port Office, which designed the bridge, says that bicycle travel would be dangerous because many large vehicles like dump trucks use the bridge. There are also no facilities on the reclaimed land side, and the undersea tunnel that is led to there is closed to bicycles. The sidewalk is both small and designed as a promenade, with a risk of accidents if bicycles were to travel on it. A representative of the Tokyo Metropolitan Government's Bureau of Port and Harbor, which manages the bridge, said, "There was also concern that the bridge's slope was steep." 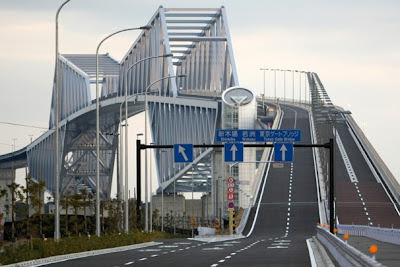 Meanwhile, the bridges of the 60-kilometer Shimanami Kaido between Onomichi, Hiroshima Prefecture, and Imabari, Ehime Prefecture, that connect islands in the Seto Inland Sea are open to bicycles due to the desire of locals to use the road for daily activities. The sections of roads and bridges are also becoming a sanctuary for cyclists wanting to enjoy the views. Municipalities along the road have offered bicycles for rent since the opening of the bridges to traffic in 1999, with 48,178 bicycles rented in fiscal 2010 and 57,701 rented in fiscal 2011. A representative of the tourism department in Imabari called the bridges "A tourism resource not existing elsewhere." At Tokyo Bay, however, in addition to Tokyo Gate Bridge being closed to bicycles, Rainbow Bridge can only be passed by bicycles if they are pushed across. Shigeki Kobayashi of the Bicycle Usage Promotion Study Group said, "The Tokyo bridge designers and managers are uninterested in bicycles, which are now an important form of transportation, and are not thinking of pedestrians, either. Bridges should be made use of in a similar way to Tokyo Tower, which caters to many tourists even though it is a broadcast tower." I think the traffic council were right in not allowing bicycles through this bridge. It is debatable, but safety first for cyclists.